Virginia Woolf, Julia Margaret Cameron’s great-niece, once stated that leisure time, privacy and financial independence are necessary for a woman in want of creative freedom and self-fulfilment. It is hard to imagine a more apt description of the conditions that helped spark the photographic career of Cameron, whose experimental and evocative portraits of the late nineteenth century challenged the status of photography and inspired artists beyond the Victorian Age. It may come as a surprise to discover that Cameron’s career did not begin until the age of forty-nine, when she was given her first camera as a gift from her daughter. Alongside was a note that read: ‘It may amuse you, Mother, to try to photograph during your solitude.’ Prior to this, Cameron had posed in front of a camera, compiled photographic albums and even printed photographs before. Nevertheless, she now began her career with a desire to assert herself as a female artistic photographer. Her home on the Isle of Wight was transformed into a photographic studio and darkroom, where she would go on to photograph family members, as well as influential public figures of her day, casting them into allegorical biblical and literary scenes. A gentle circular motif, suggested by the rounded forms of the flowers, is further conveyed by the arrangement of the sitters – each seated figure is framed with a standing figure – lending the image a sense of symmetry. This harmony and fluidity is fused with an air of quietness: the subtly tilted heads of the central figures and the positioning of their arms near their chests adorns them with a Virginal quality that draws attention to their innocence and purity. The faded and blurred outlines of the sitters, in addition to their loosely flowing hair and wistful expressions, captured in profile and face on, echo the sense of longing and sensuality in Tennyson’s ballad. Julia Margaret Cameron, Beatrice, 1866, albumen silver print, 33.8 × 26.4 cm, J. Paul Getty Museum, Los Angeles. https://www.flickr.com/photos/geldenkirchen/275533515. Cameron was also fascinated by the theme of the tragic female heroine, which is best illustrated in the individual portraits of her tableaux vivants. An expression of the emotions of the sitter, rather than a mere record of her physical features, is evoked by the close-up, cropped composition and the shallow space of the tableau Beatrice (1866). May Prinsep, who poses as the tragic noblewoman of Percy Bysshe Shelley’s play The Cenci (1819), is pushed up against the picture plane, revealing Cameron’s intimacy with the sitter. Cameron’s photographic portrait is highly dramatic: the viewer is confronted with the subject’s introspective and melancholic expression in what appears to be a private moment. Shelley’s heroine Beatrice is modelled on the sixteenth century figure who was condemned to death after exposing her father’s sexually abusive treatment of her. In this way, Cameron’s tableau forms a political commentary on the inequality of the gender dynamic, in line with Victorian gender roles. Despite the rise of secularism and the preoccupation with evolutionary science during the Victorian Age, Cameron produced many allegories of religious subjects in her tableaux vivants. 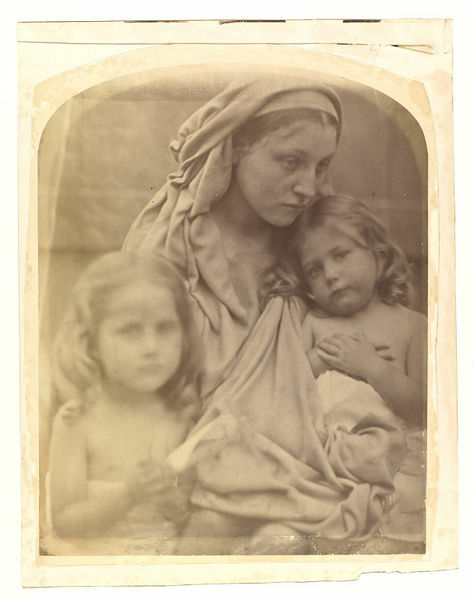 She often turned to the image of the Madonna as reflected in her group portrait entitled Love (1864), as an embodiment of her ideas on femininity. Almost reminiscent of the ‘rugged naturalism’ that characterised Caravaggio’s portrayals of religious figures in his church altarpieces, Cameron presents an unidealised representation of the Virgin: her parlour maid gazes off to the side with a humble shawl loosely draped around her head, holding two children. In marked contrast, Cameron evokes the shape of a halo around her sitter’s head in an explicit reference to the Virgin in La Madonna Vigilante (1864). In both images, Cameron emphasises the maternal role of the Virgin Mary, imbuing her with a sense of ‘earthiness’. A paradox is highlighted: as both mother and virgin, she represents an unattainable realm for women – perhaps a reflection on the sexual repression of the Victorian Age. The photographic process Cameron used – wet-collodion glass negatives printed on albumen paper – was common during the 1860s and marked a departure from the daguerreotype process that dominated the first two decades of photography following its invention in 1839. Though it was a slightly quicker process than the daguerreotype, and rendered detail with greater precision, it was messy and volatile. It required time, space, and handling toxic chemicals. After thoroughly coating the glass plate with collodion, a syrupy substance, and making it light sensitive by submerging it in silver nitrate, it was immediately sensitised in the darkroom. Then, whilst the plate was still wet, it was carefully inserted into the wooden, box-like camera. Cameron’s sitters would normally have to hold their pose for a period of three to seven minutes, whilst the glass plate was exposed to light. After that, it was returned to the darkroom to be developed, fixed, washed, dried and varnished, before being printed onto paper. It is important to note that Cameron had the financial means to acquire all the equipment and materials to create her photographic works. The painterly, experimental style of Cameron’s portraits were radical, rebelling against the status of photography. Photography was believed to be a scientific and mechanical medium that, according to Lady Elizabeth Eastlake, was made by an ‘obedient machine’ requiring no artistic freedom. Photographic portraits were certainly a successful commercial enterprise, but were not viewed as high art. From the very outset, Cameron intended to ‘ennoble Photography’, by highlighting its capacity for personal expression. She placed an emphasis on post-photographic manipulation, including scratches, smudges and other traces of the artist’s process on her negatives. For example, in her tableau The Passing of Arthur (1875) Cameron depicts a group of damozels and hooded figures surrounding the wounded King Arthur whilst travelling from Camelot in a boat. She scratched the form of a crescent moon onto the left-hand corner and experimented with chemicals to achieve a smudged effect in the foreground, creating the illusion of mist lurking on the water’s surface. Juxtaposed against the soft black background, her experimentation with tone and texture is clearly identifiable. Critics have noted that by highlighting the artist’s mark, Cameron’s photograph is ‘feminised’: it is undoubtedly a home-produced photograph, which evokes the domestic role of women. In identifying where and by whom the scene was photographed, the viewer feels the presence of the human figure behind the camera, no longer making photography feel machine-like. Cameron’s painterly style offended the aesthetic sensibilities of the British Photographic Society. 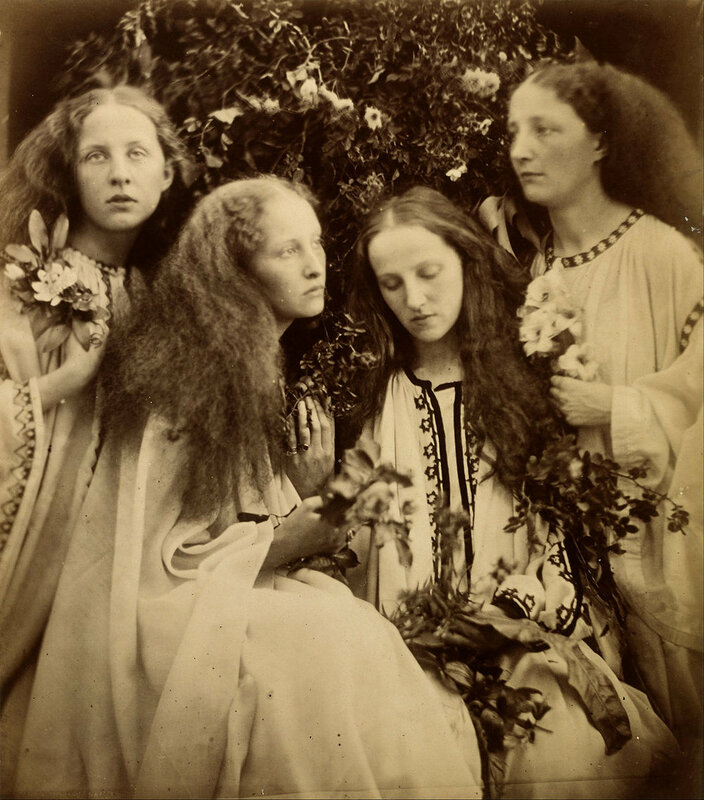 She rejected the sharp precision prised in photography at the time, in favour of a romantic vision that suggested emotion and spirituality through her pioneering soft-focus technique and interest in atmospheric shadow, echoing the work of her artistic contemporaries, the Pre-Raphaelites. Her innovative approach to tonality and colour was equally rebellious: by experimenting with the exposure time and the amount of light exposed onto the albumen paper, in addition to the printing time, her photographs were far from monochrome: they ranged from a lighter to a richer and darker brown. Assertive and ambitious, she was determined to put the lack of support from the British Photographic society aside and make a name for herself. Cameron was fortunate enough to have connections amongst the intellectuals and artistic circles of Victorian society, which she drew upon to launch her career. Within a year of taking up photography, Cameron had exhibited her works in Berlin, London and Paris, and sold many prints. A year later, her photographs were in a public art collection: Cameron sold her photographs to the South Kensington Museum (now the V&A) and in 1868, the Museum granted her the use of two rooms as a portrait studio, arguably making her the Museum’s first artist-in-residence. It was uncommon for a woman to present herself as an artistic photographer, let alone an artist, alongside male photographers who dominated the field during the Victorian era. Whilst Cameron was one amongst a few female amateur photographers active during the 1860s, such as Lady Clementina Hawarden, the success she enjoyed is incomparable to her female counterparts. Armstrong, Carol. 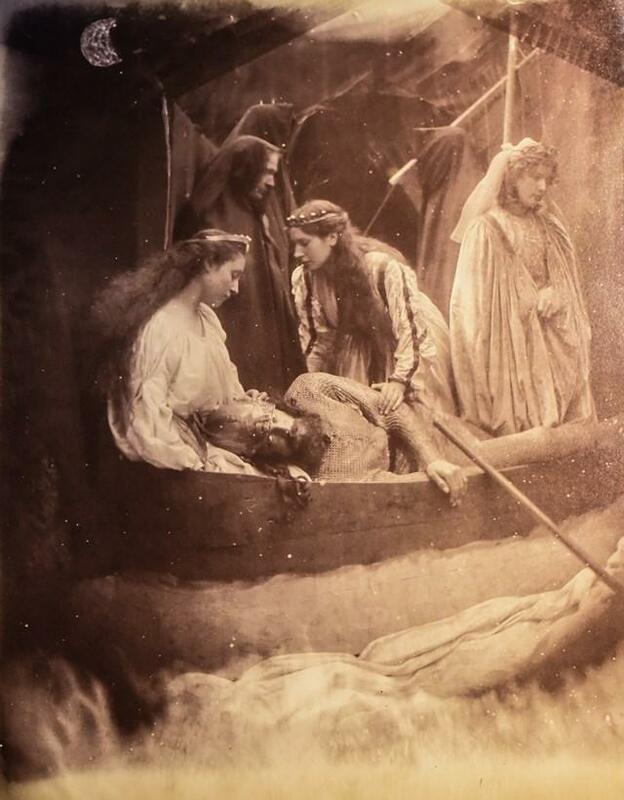 “Cupid's Pencil of Light: Julia Margaret Cameron and the Maternalization of Photography.” October76 (1996): 115-41. doi:10.2307/778774. Eastlake, Lady Elizabeth. “Photography.” Compiled by Charles Harrison, Paul Wood, and Jason Gaiger. In Art in Theory, 1815-1900: An Anthology of Changing Ideas, 655-662. Oxford: Blackwell Publishing, 1998.